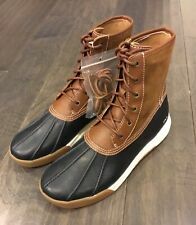 Ralph Lauren Polo Dover II Leather Ankle Duck Boots. Get out in the great outdoors in Polo Ralph Lauren's hiking boot. 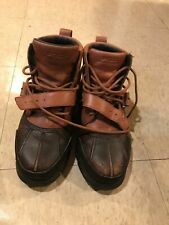 Condition: Preowned, minor signs of wear on the outsole (heel) Small rubber logo is missing on the right boot. In Very Good Condition. Laces & Buckle. Leather Upper Rubber Sole & Textile Lining.